The bass part for Mahler's Symphony No. 4 in G major has been edited by Paul Ellison, in-demand double bassist, professor, presenter, and former Houston Symphony Orchestra principal bassist of 23 years. Ellison's bowings, fingerings and other editorial markings have been added throughout the score. Mahler's Fourth is one of the composer's shorter symphonies, clocking in at only about an hour. Mahler's first four symphonies feature themes that originate in earlier songs by Mahler on texts from Des Knaben Wunderhorn (The Youth's Magic Horn). However, the fourth symphony is built around a single song, "Das himmlische Leben," which presents a child's vision of Heaven. Symphony No. 4 begins with a classically sonata form movement, followed by a scherzo & trio then a solemn processional march cast as a set of variations. The song is prefigured in various ways in the first three movements, but in the fourth and final movement the song sung in its entirety by a solo soprano. The soprano represents the child presenting a sunny, naive vision of Heaven and describes the feast being prepared for all the saints. 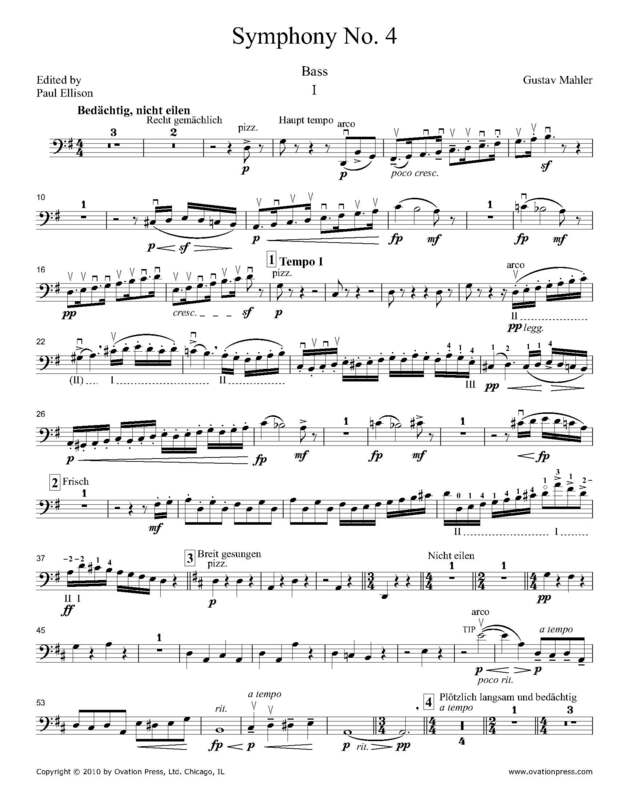 Download and print the score today to gain access to expertly edited Mahler Symphony No. 4 bass fingerings and bowings from Paul Ellison!